Until recently, miraculous-healing mega-dose vitamin C could only be delivered through IV, and not orally. Those levels either blow out the bowel tolerance level or get urinated out before they can do their work. But now, you can achieve the results of IV mega-dose vitamin C orally, successfully. It’s called Liposomal vitamin C.
Liposomal vitamin C is a lipid encapsulation of ascorbic acid granules that delivers more vitamin C to cells orally than even mega-dose IV vitamin C. At first, vitamin C expert Dr. Thomas Levy found this hard to believe, even as clinical results were being achieved. He investigated further and was impressed. It’s estimated that maybe 20% of IV vitamin C volume gets into cells, while 90% of liposomal C permeates tissue on a cellular level. Vitamin C is water soluble, and cell walls are fatty. Liposomal C is lipid (fatty substance) encapsulated on a molecular level. This enables higher oral doses of vitamin C to permeate cells while not overwhelming bowel tolerance. If a cardiologist MD with years of experience administering mega-dose vitamin C such as Dr. Levy was impressed, you could be impressed too. Some of you may be familiar with the story of New Zealand dairy farmer Alan Smith, who recovered rapidly from a coma due to flu complicated double pneumonia and leukemia. Many online versions make it seem his recovery was only from IV C.
But after several legal attempts from Alan’s family to continue administering 50 to 100 grams of IV C after showing positive results when they were ready to pull the plug on his life support, the hospital cynically conceded to continue with only two grams of IV C daily. That’s when his family members found out about a newly produced liposomal C which they brought to Alan daily. Each packet contained one gram of encapsulated vitamin C. Alan consumed six daily and achieved the miraculous results he had experienced with the 50 to 100 grams daily of IV C.
Yes, six grams of liposomal C did the work of 50 to 100 grams of IV C.
He walked out of the hospital in days on his own power. A year later, he was examined and there was no trace of leukemia either. Here’s a New Zealand 60 Minutes video clip that covers his story well. Another example of liposomal C’s power: at the Fukushima hot spot, a team of orthomolecular (mega-dose supplement medicine) scientists administered 25 grams of IV C before working and six grams daily of liposomal C to one group of site clean-up workers while giving none to another group. The vitamin C crew came back with no signs of radioactive poisoning while the crew without vitamin C showed high toxicity levels. That radioactive poisoned group was given the same IV and liposomal C treatments as the first group, and they all recovered. This research team’s efforts at communicating their results were suppressed despite their pleas with various Japanese officials. Practitioners who administer mega-dose IV vitamin C are not easy to find, and neither is insurance coverage. But orthomolecular.org provides a directory of practitioners who deliver mega-dose IV vitamin C.
Lypo-Spheric liposomal vitamin C is manufactured by Livon Labs, where you can get great information on how liposomal C works. But you can get it for around $30.00 U.S. for a box of 30 one gram gel packets from other sources. That may be pricey for normal vitamin C intake. But for a serious condition, it’s easier than trying to find a practitioner who can administer IV mega-dose vitamin C, and it’s a lot less expensive. Disclaimer: This story is for educational purposes and should not be construed as medical advice. Whilst I am a great believer of the power of ascorbic acid as I used it to cure my cancer, some of the claims of Lypospheric C are extremely inaccurate and misleading. 30,000 umol/L). Put simply, vitamin c IV is superior to Lypospheric C by a factor of 12.5 and vitamin C infusions are superior by a factor of 62.5+. One must read through the marketing hype of products and research their claims. The cost of Lypospheric C is extortionate. It is now wonder people are making their own successfully. If DMSO (dImethyl sulphoxide) is added (1 ml per 8 grams), it will achieve the same cellular saturation as Lypospheric C at a fraction of the cost. This info about DMSO and Vit C is really something, but I would appreciate any indication of a source, any scientific papers or something to back it up? If this is so, DMSO should always used in vit C IVs. RealityCheck..URA BigPharma Troll…go away & stop spewing Garbage. Ascorbic acid is the final product of the 4-step synthesis pathway in mammals. That pathway, a branch of the citric acid cycle, picks off 60 mg-kg/day of glucose. But we only make the first 3 enzymes because we only have the first 3 genes. We lack the 4th gene, for GLO. Thus we can’t make the enzyme and so we can’t finish the synthesis. That is scurvy’s true root. Fortunately, it’s 2014 and the gene has been put back into human fibroblasts in vitro. It works fine. This lack is nearly confined to primates and is the root of why we age so rapidly: because vtC is the centerpiece of antioxidant defense of life on Earth, and we lack it! Guess what I plan to do by 2030. Sorry Tatiana…I am not sure what your saying…do you agree or disagree with the Main Article? Get off the gene codes. Lack of vitamin c….why do they call the british sailors limeys?. Mercola makes it sold at vitamin shoppe. You can make it too, lots of u tube vids. There is data on blood levels using the live on product showing iv blood levels for comparison so the data is there and it is certainly easy to redo this test. 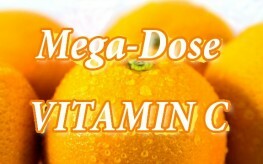 vitamin c was used in huge dosages in the 1940’s and 50s to cure numerous issues. Now with easy availability it should make a huge comeback. But how useful, when there’s profits to be made? Don’t get me wrong, I’m a keen capitalist and I work as a freelance marketer – which is exactly why I can immediately recognise the various selling techniques. They’re not BAD techniques; I use them myself for clients all the time. But when time after time he talks of how various things are great for you, just great – but not the kind you buy in the shops, no, those are rubbish! Heck, they even do you harm in some cases! No, what you need is the special type, treated or produced in the only way that really brings you the awesome benefits this herb or whatever can give you. Why waste your money – and risk your health – on anything else? Don’t feed those nasty companies ripping you off, buy the special and effective version sold right here – free shipping! Yes Alan, he cuts thru the Garbage with truth and offers you the chance and choice to obtain scientifically researched unbiased products that are not rubbish. That’s why he is hated and ridiculed by the synthetic BigPharma boys that brainwash the Sheeples into buying into their Toxic Killing drugs. Why do you call disapproval “hate”? because bigPharma hates the truth…cuts into their lying profits. because Mercola is big business!!! I have followed Dr. Mercola for about 14 years. At a time when there were not many medical professionals questioning what they learned from the Big Pharma in medical school, and I as a medical professional knew we were overmedicating people and not getting to the root of patient’s problems. I was absolutely delighted to find him and learn from him. He was cutting edge then and is still. He addresses even the type of light bulbs we choose to use. The light spectrum varies with LED, fluorescent, incandescent etc. Since they are different and impact our sleep and health it’s good to know what choices we are making in even lighting in our homes. I am fine with Dr. Mercola acquiring income from sharing info. and products he recommends. His reach as a health practitioner is greater through the internet than if he had a clinic. So if someone is trying to impact world health in a positive way I see his approach as current and extremely valuable. He does not charge for the info. including in-depth interviews he shares…… so consider that. It was used as a cure all in the 40’s and 50’s. It cured polio and TB. It fell out of favour due to one pill fixes all – Penicillin. Google, Abram Hoffer MD, Klenner MD and Cathcard MD. These doctors worked with vitamin c for over 50 years and there results, whilst shunned by the big pharma, were nothing short of miraculous. Does anyone know if mixing vitamin C with lethicin would make it “Lipsomal”? It will not. Lecithin, like all lipids is a fat. It is therefore hydrophobic. Vitamin C is hydrophilic. The two cannot be combined and in no instance will you ever hear or see a description of how such a magical thing occurs on the molecular level. I’m still hoping someone who knows what he/she is taking about to answer my question. What I stated is fact. If you believe anyone is forming lecithin into micelles which contain vitamin C and magically survives the gi tract to be absorbed intact, you are sorely mistaken. The body simply does not work that way. You are clearly the typr of person who will readily accept anyone who buys this nonsense as someone who “knows what they’re talking about. You exhibit classic confirmation bias. This causes a terrible error in logic on your part, resulting in a flurry of ad hominems without substance. There has never been any reputable research published on the matter, Even Google results list nothing but altie websites with no evidence whatsoever to back up their claims. You should really develop an ability to think critically. I’m not a fool, I do know science, and the exact statement of yours I objected to was your claim that oil and water can Never mix at the molecular level.. That’s just wrong, don’t you even know how soap or detergent work? They do exactly that, I wonder where you come from, strange planet I guess. “k” lethicin is in fact not a “fat”. It’s molecules have a oleophilic end and a hydrophilic end. Thus it encourages mixtures of oils and water. These are called Emulsions. @RealityCheck, I advise a person as ignorant as you should not have such a misleading tag and perhaps shutting up would save embarrassment? This sounds like an advert?? ?